Fire Roasted Garlic Beef & Quinoa Chili is a fast and healthy one-dish skillet meal. I’m sharing another favorite skillet recipe with the new McCormick Skillet Sauces, like the Sicilian Chicken Skillet Over Parmesan Zucchini Noodles that I posted last week. It’s fast, healthy and really delicious! The best part about this Fire Roasted Garlic Beef & Quinoa Chili recipe is that it’s ready in under 30 minutes!! These super quick and easy skillet sauces are made with all-natural herbs and spices. They come in 7 different flavors: Smoky Applewood BBQ Chicken & Bacon, Taco with Chipotle & Garlic, Sesame Chicken Stir-Fry, Sweet & Smoky Sloppy Joes, Fire Roasted Garlic Chili, Fajita with Roasted Chili, Garlic & Lime and Sicilian Chicken with Tomato, Basil & Garlic. A few of the sauces come with slow-cooker directions, so you can fix it and forget it! Heat a large, non-stick skillet over medium heat. Sauté ground beef and onion until beef is fully cooked and no longer pink. Drain fat from ground beef and onions and add meat back to the pan. Stir in quinoa, olive oil, beans, tomatoes and skillet sauce. Bring to a boil, then reduce heat to low and simmer uncovered 10 minutes or until heated through. Season with sea salt and freshly cracked pepper, to taste. Find more delicious skillet recipe inspiration on the McCormick “Easy Skillet Dinners” Pinterest Board and more of their great pin ideas here. Don’t forget to follow McCormick on Facebook and Instagram as well! *This post is sponsored by McCormick in conjunction with a social media campaign through Sunday Supper LLC. All opinions are my own. Don’t miss out on more McCormick inspired skillet sensations from my Weekday Supper friends below! Yep, a big bowl of a tasty way to warm up from the inside out. Yum! 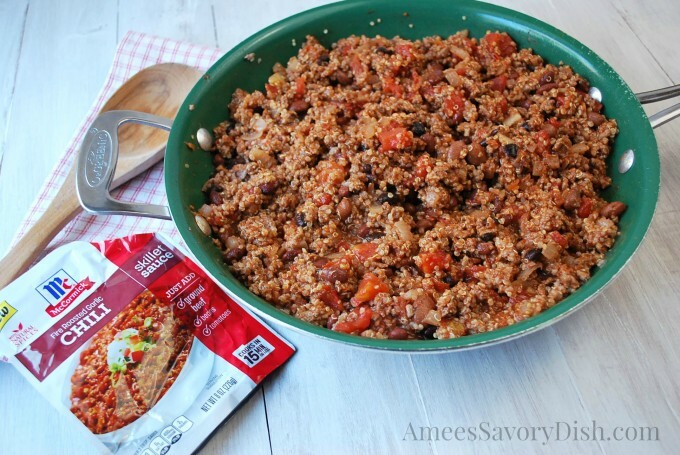 love the addition of the cooked quinoa here in this chili! and I loved the fire roasted garlic chili from the skillet sauces. . I think it was my favorite! love this, Amee!! I love quinoa in my chili! This looks so simple and delicious! Can’t wait to try it! So simple, but I can only imagine…so full of flavor!!! Beef and quinoa sound great as a chili with this McSkilletSauce! I love quinoa in my chili! I could use a big bowl of this chili right now. I mean a really big one. Yummm! Love this healthy and flavorful dish. Pinned. I love the sound of this chili! It sounds so hearty and the quinoa is a lovely touch to it! Thank you Simon! Glad you stopped by!